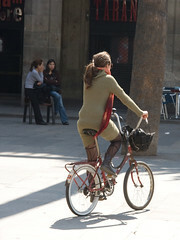 Cycle Chic®: More More More Barcelona! Just can't get enough of this town. Stand and deliver, in style. I thought they had the dreaded Mandatory Helmet Law in Spain? 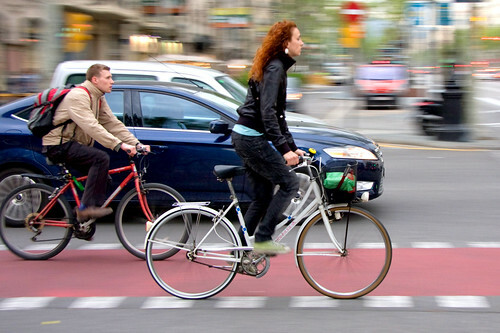 Helmet use is mandatory in Spain only for open road-iterurban rides. If you remain in the streets of the town-city is just recomended. There is no way that the local governments cand force the bikesharing scheme users to wear helmets. 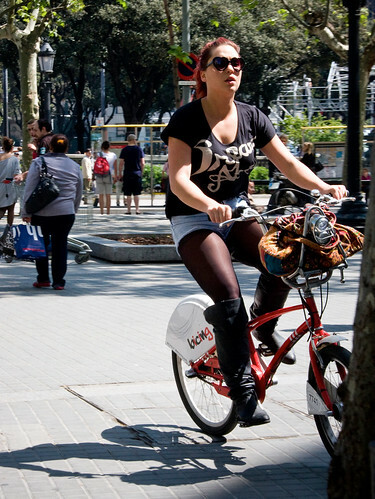 "There is no way that the local governments cand force the bikesharing scheme users to wear helmets." They are going to do just that here, sadly. So, the users need to carry their own helmet to use the service? At this stage they're 'looking at possible solutions' but the bike hire scheme is supposed to be rolled out in the next few months. It's a joke and it's going to fail. lice is not really the main problem with sharing bike helmets. there's more issues with ringworm and MRSA as well as other skin diseases. In almost a week in Barcelona I saw only a handful of helmets. They were, as a rule, on the heads of people cycling with cycling gloves and 'gear'. The Spanish, like the French and Italians, seem to be a rational nation. The helmet law, as Juan points out, is only for cycling outside of cities, and even then there are loads of watered down clauses like "you can take off if your helmet if it's too hot, or if you're going up a hill..."
there is no enforcement. there was a great deal of lobby work by cycling groups when the law was proposed and they succeeded in killing off the original proposal and watering it down to nothing but symbolic.